BACKGROUND: The benefit of screening for decreasing the risk of death from colorectal cancer (CRC) has been shown, yet many patients in primary care are still not undergoing screening according to guidelines. There are known variations in delivery of preventive health care services among primary care physicians. 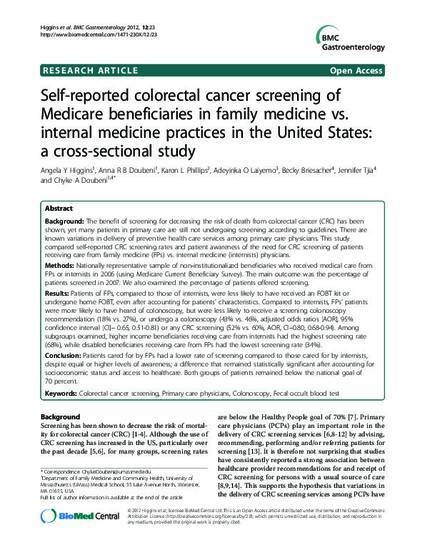 This study compared self-reported CRC screening rates and patient awareness of the need for CRC screening of patients receiving care from family medicine (FPs) vs. internal medicine (internists) physicians. METHODS: Nationally representative sample of non-institutionalized beneficiaries who received medical care from FPs or internists in 2006 (using Medicare Current Beneficiary Survey). The main outcome was the percentage of patients screened in 2007. We also examined the percentage of patients offered screening. RESULTS: Patients of FPs, compared to those of internists, were less likely to have received an FOBT kit or undergone home FOBT, even after accounting for patients' characteristics. Compared to internists, FPs' patients were more likely to have heard of colonoscopy, but were less likely to receive a screening colonoscopy recommendation (18% vs. 27%), or undergo a colonoscopy (43% vs. 46%, adjusted odds ratios [AOR], 95% confidence interval [CI]-- 0.65, 0.51-0.81) or any CRC screening (52% vs. 60%, AOR, CI--0.80, 0.68-0.94). Among subgroups examined, higher income beneficiaries receiving care from internists had the highest screening rate (68%), while disabled beneficiaries receiving care from FPs had the lowest screening rate (34%). CONCLUSION: Patients cared for by FPs had a lower rate of screening compared to those cared for by internists, despite equal or higher levels of awareness; a difference that remained statistically significant after accounting for socioeconomic status and access to healthcare. Both groups of patients remained below the national goal of 70 percent. © 2012 Higgins et al; licensee BioMed Central Ltd. This is an Open Access article distributed under the terms of the Creative Commons Attribution License (http://creativecommons.org/licenses/by/2.0), which permits unrestricted use, distribution, and reproduction in any medium, provided the original work is properly cited. Medical student Angela Higgins participated in this study as part of the Senior Scholars research program at the University of Massachusetts Medical School.